Just 338 days 10 hours until the fun starts! 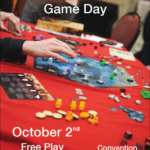 GameStorm, Portland’s Premier Gaming Conference, is excited to present its first Free Play Game Day for the upcoming GameStorm 19 Convention on Sunday, October 2. Gather up your friends, family and twenty dies for a free play day! The GameStorm Free Play Game Day will be from 9am-9pm at the Jantzen Beach Red Lion, 909 N Hayden Island Dr, Portland, OR 97217. Don’t hesitate to check it out since memberships for the upcoming GameStorm 19 Convention will be 10% off! Why: Because everyone deserves a free play game day! © 2013 GameStorm is a production of Oregon Science Fiction Conventions, Inc. (OSFCI), a non-profit, tax-exempt corporation.